Quite often we let ourselves get hungriest as dinner time approaches. This usually results in dinner being not only our biggest meal of the day, but also our richest. The problem is that having to digest all this food overnight can result in restless sleep as the body works hard to break down all the proteins and fats. Using a selection of tried and tested light dinner recipes could be your saving grace as far as a restful night’s sleep is concerned! The old saying ‘finish your meal for the day before sunset,’ ties in with how the body reacts to daylight and digestion throughout different parts of the day. People used to wind up their dinner timings by 6.00 p.m, after eating lunch at noon. Nowadays, 7.30 – 8.30 is a more realistic timeframe for the last meal of the day. In hotter countries, it’s even later. I try not to get caught up with timing, and think focusing on what you eat and how much you eat is far more important than the time you eat it. Another relevant factor in our ability to digest well, is the way in which we eat. There are certain do’s and don’ts to take into account, which when applied could dramatically change the way you feel. To read more on that, and gain some seriously useful tips on how to keep your digestive process under control, check out our “Ayurvedic tips for flawless digestion” blog. Everybody’s routine and body clocks are different, so if you’re headed to bed after midnight having only eaten at 6pm, you’re going to be too hungry. Forcing yourself to eat much earlier than what you’re used to (even when it is a light dinner) could lead to late night snacking which is exactly what we want to avoid when aiming for healthy digestion. Ideally, you should be eating no later than 3 hours prior to turning in for the night. As for what foods to choose, vegetables are easiest for the body to digest. 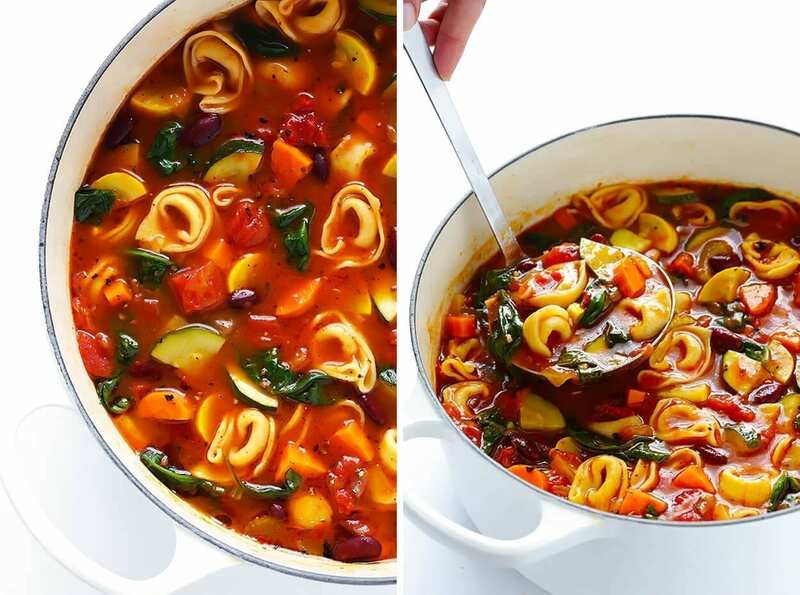 Light dinner recipes should consist mainly of plant based foods – think vegetable soups, stews and broths! Preheat the oven to 400°F (204°C) and line a large baking sheet with parchment paper. Cut the squash in half lengthwise, and scrape out the seeds. Place the squash, cut-side up, and the shallots on the baking sheet and drizzle with olive oil and pinches of salt and pepper. Wrap the whole garlic cloves in foil and place on the sheet. Roast for 35 to 45 minutes, until the squash is tender. In a blender, combine the coconut milk, lemongrass, ginger and curry paste. When the roasted vegetables are cool to the touch, scoop out the kuri squash flesh, unwrap the garlic, and add both to the blender along with a pinch of salt and pepper. Blend until creamy. Add the water, lime juice, and olive oil and blend again. Add more water or broth to thin the soup to your desired consistency. Taste and adjust seasonings with more salt, pepper and lime juice. 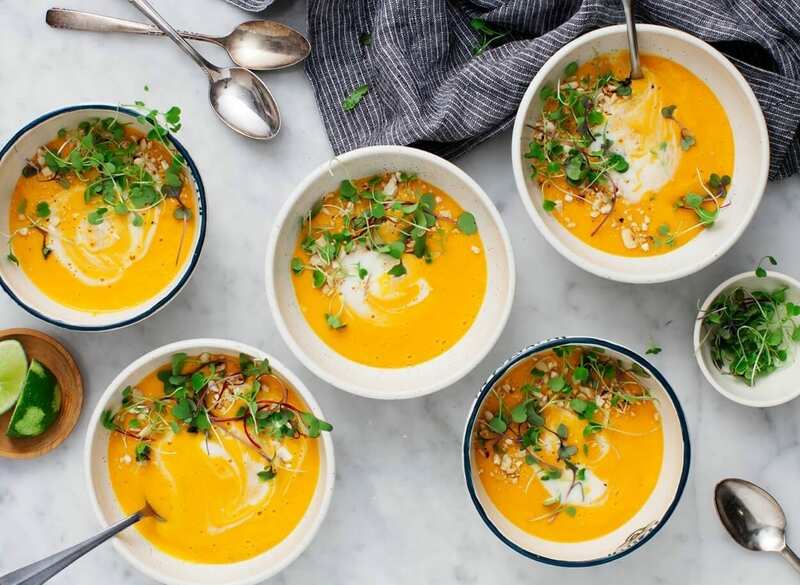 Serve with coconut milk, toasted cashews and micro greens. If you don’t love coconut, start with ½ the can, adding more to taste. If you don’t have access to fresh lemongrass, skip it and add lime zest instead. If you’re sensitive to spice, you may want to start with less red curry paste. If you love spice, add more to taste. Curry pastes can vary in level of spice. 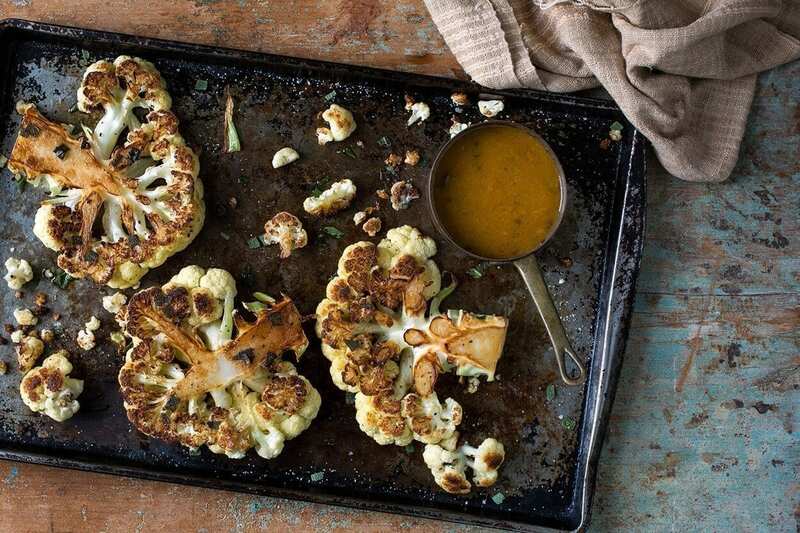 Make the cauliflower steaks: With a sharp knife, cut the cauliflower into 1-inch-thick slices. (You should get about 8 slices.) Rub both sides of each piece of cauliflower with about 1 teaspoon olive oil. Sprinkle both sides of each piece with ½ teaspoon smoked paprika, salt and pepper. Heat the remaining 1 tablespoon olive oil in a large cast-iron skillet over medium-high heat. Working in batches, sear the cauliflower steaks until they are golden brown, 3 to 4 minutes per side. The cauliflower should be easily pierced with a fork but not so tender that it falls apart. Authors Notes: Leftover sauce will keep in the refrigerator for up to a week. Make the yogurt sace: In a small bowl, stir the yogurt with the lemon juice and salt to combine. Add the Sriracha and paprika. Stir in ¼ cup water (or more, if needed) to achieve a thin, easy-to-drizzle consistency. Make the salad: In a large bowl, toss the lettuce and radicchio to combine. 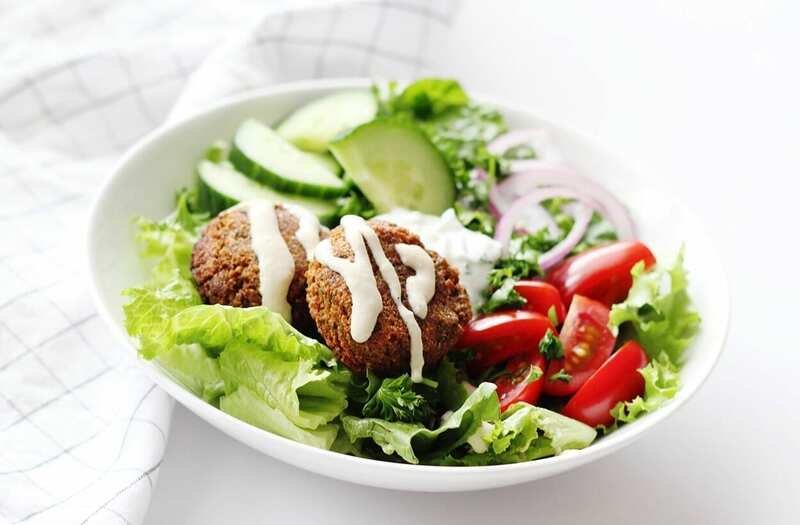 In a medium bowl, toss the cucumber, tomatoes, red onion, garlic, parsley, cilantro and mint to combine. Add the olive oil and season with salt and pepper. To serve, pile a quarter of the lettuce mixture onto a plate, then top with about ½ cup of the cucumber-tomato mixture. Top with 4 falafel patties and drizzle generously with yogurt sauce. Repeat with the remaining portions. Serve immediately. Add the stock, tomato paste, tomatoes, kidney beans, zucchini, yellow squash, and Italian seasoning, and stir until combined. Bring the mixture to a simmer. Then reduce heat to medium-low, cover, and simmer for 10 minutes to let all of those good flavours meld together. Stir in the spinach and cheese tortellini, and cook according to package instructions until al dente (usually about 5-6 minutes). Taste, and season the soup with salt and pepper. Serve immediately.